When the securities market fluctuates or the market downs turn, investors can apply SBL as the alternative investment tool to invest in such market circumstance. The company provides SBL to all investor types by which the company will loan securities to those investors (Borrowers) who want to borrow securities for short selling and then buy the securities back to company when the securities price goes down as expected. Meantime, any investors who hold securities can increase their return on investment by lending their securities to the company, we called this investors group as Lenders. The company will act as a principal to investors who are borrowers and so does with those lenders to ensure the investors of the great achievement of terms and conditions in the SBL Agreement. 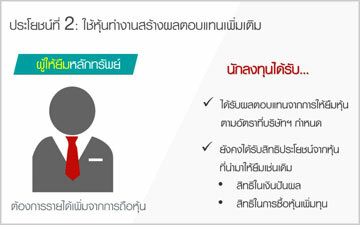 According to the rules of the Stock Exchange of Thailand, the SET allows investors to do short selling in the following groups of securities. 3) Securities having 3-month average market capitalization of not less than 5,000 Million Baht, and having free float of not less than 20% of paid-up capital, which shall be announced by the SET. Period of borrowing and lendingis flexibly determined as At Call. This, therefore, allows both borrowers and lenders to terminate the borrowing and lending positions at any desired period. The company employs SBL Real Time System as the platform of SBL service to all investors. The SBL system itself can immediately respond to the needs of borrowers who are expecting the faster service and efficiency. Meanwhile, the lenders gain the highest level of flexibility of employing the SBL system. Typically, the investors will look for a chance to buy securities in cheaper price and sell out at the higher price. 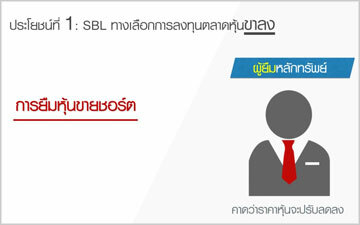 But when the market is declining, the investors can also find the investment opportunity thru SBL service. They can borrow securities for short selling at higher price and then buy the securities back at cheaper when the market price goes down as expected to return such securities and pay a borrowing fee to the company. The return on investment is the gap between short selling price and buying back price less borrowing fee. The following securities accounts are required for borrowing stocks and short selling. 1. Special borrowing fee rate, no handling fee. 2. SBL service is available via your financial advisor or via the internet system, accessible from everywhere. 3. Borrowing steps are simply, no queuing, borrowed securities will be transferred to borrower’s account without delay. 4. Plenty of securities names and volume for lending from retail investors and institution investors. Regardless the market circumstance, SBL reveals a chance for investors who hold securities and want to increase the return on investment by lending their securities to the company. The return of lending fee will be at higher rate compared to the interest rate. However, the company provides flexible service to investors by which the investors can sell their loaned securities at their desires. This service, therefore, suits to all investors’ type. 1. Investors gain lending fee at higher rate compared to the interest rate. 2. Investors will get cash collateral following the value of loaned securities as a protection of lending risk. 3. Investors have flexibility to sell, transfer, or withdraw their loaned securities at their desire, so investors will not lose a chance of selling their own securities. 4. Investors still hold the entitlement of the dividend payment and right issues of loaned securities. 5. Value of loaned securities is still calculated as 20% collateral in the trading account.